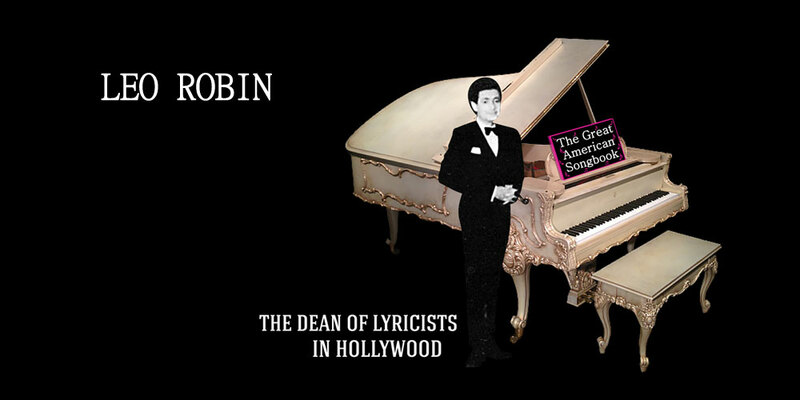 Leo Robin (1895-1984) stumbled onto his great songwriting career by accident. The oldest in a Pittsburgh family of six brothers and sisters, he worked as a newspaper reporter, a social worker and a writer of advertising copy to help support his family. In 1915, he went to law school at the University of Pittsburgh to please his father, Max, an insurance salesman and poet, who wanted him to become a lawyer and a judge. He wasn’t happy and left after one year. In 1916, he became a cub reporter for the Pittsburgh Chronicle-Telegraph where he wrote an “Advice to the Lovelorn” column, which he later said helped him with his love songs. One night, he went to the theater and his whole life changed. He had a new ambition — to become a playwright. In 1917, he enrolled in night school at Carnegie Tech to study drama and eventually left his day job on the paper to become a social worker at Big Brothers, a progressive charity organization for ‘wayward young boys.’ He found that having them perform on stage was good therapy and he began writing little plays especially for them. It was at this time that philanthropist and President of Blaw-Knox Steel, Alfred Lehmann, who was also on the Board of Big Brothers, saw the potential in Leo with his literary skills to fill a position and offered him a higher-wage job to write advertising copy for his steel mill. Leo, always restless, moved on to this new position and stayed there for several years. But he still wasn’t happy. The lure of Broadway had taken hold and he realized he had to go to New York to pursue his dream of writing for the theater or of becoming an actor or a director. He even moved to Greenwich Village. A letter of introduction was sent from his drama professor at Carnegie Tech to playwright, director and fellow Pittsburgher George S. Kaufman. When Leo showed Kaufman some of his ‘little plays,’ Kaufman asked: “Is there anything else you can do?” Leo said, “Well, I’ve written some poetry.” Kaufman said, “Maybe you could write lyrics.” Leo used to joke that he didn’t know what Kaufman meant by ‘lyrics.’” “You know, words for songs,” Kaufman explained and sent Leo to producer and songwriter Lew Gensler. Gensler advised Leo to become familiar with successful songs of the day and to practice, practice, practice. Leo followed his advice and sent song after song after song to Gensler. Eventually, Gensler was satisfied and showed Leo’s lyrics to Buddy DeSylva, with whom Gensler was working at the time, on a show, Queen High. 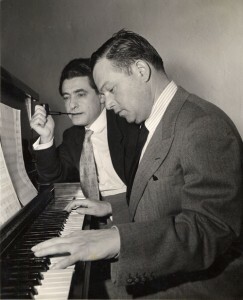 Songwriter Buddy DeSylva was Leo’s idol and DeSylva offered him the chance to write a song with composer Richard Myers for The Greenwich Village Follies. Then, Leo met the Gershwins who introduced him to Max Dreyfus, the head of Harms music, who signed Leo immediately. Soon, Max Dreyfus turned Leo’s attention to the Broadway stage and Leo, between the years of 1926 and 1928, worked on eight Broadway shows: By the Way (1925), The Merry World and Bubbling Over (1926), Judy, Hit the Deck, Allez-Oop!, and Just Fancy! (1927), and Hello Yourself (1928). 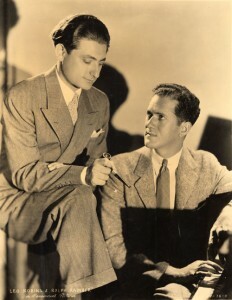 The song, “Hallelujah!” from the smash hit, Hit the Deck (1927), with music by Vincent Youmans, was such an international success, that when Paramount asked Max Dreyfus to send them out a ‘hit-maker’ to work with Richard Whiting on Maurice Chevalier’s first American movie and Paramount’s first musical, Innocents of Paris, Dreyfus chose Leo. In 1930, Leo met Ralph Rainger. They shared similar backgrounds and found each other by pure serendipity. They both had fathers who wanted them to be lawyers but eventually defied them and went on to become songwriters. They both started out in New York and found their way to Hollywood and each other. For over a decade, they were Paramount’s most successful songwriting team. They wrote hundreds of songs for a cavalcade of characters featured in a variety of diverse films, from Marlene Dietrich’s Helen Faraday, a cabaret singer, in Blonde Venus (1932) to five-year-old Shirley Temple’s Martha Jane in Little Miss Marker (1934), from Claudette Colbert’s Sally Trent in The Torch Singer (1933) to Jessica Dragonette’s Princess Glory of Lilliput in the animated version of Gulliver’s Travels (1939). They also worked on many Bing Crosby movies which turned out some of their greatest songs like “Blue Hawaii,” “Here Lies Love,” “June in January,” “Love in Bloom,” “Please,” and “With Every Breath I Take.” The Big Broadcast series (1932, 1935 and 1937) led to Bob Hope’s now-famous screen debut in The Big Broadcast movie (1938) featuring the Oscar-winning “Thanks for the Memory” which became Bob Hope’s theme song. They wrote “Easy Living” for the film of the same name in 1937 and it was the film’s only song and was only performed instrumentally. “Easy Living” since has become a jazz standard, made famous by Billie Holiday, Ella Fitzgerald and many other jazz and pop singers. Their final Paramount project was the fully-animated version of Gulliver’s Travels. After Paramount, Leo and Ralph moved to Twentieth Century Fox, where they wrote songs for Betty Grable and Rita Hayworth. Sadly, their long successful partnership was about to come to an end – Rainger was in a fatal plane crash in 1942. Leo stayed on at Fox alone for a few more years. He started writing again with old friends, like Harry Warren. They wrote the famous “Lady in the Tutti Frutti Hat” for Carmen Miranda and “Zing a Little Zong” for Bing Crosby. During Leo’s thirty years of writing for the movies, he was nominated for Ten Best Song Academy Awards: The first, for “Love in Bloom” was in 1934 – the year the Academy Awards started offering an Oscar for Best Song. “Whispers in the Dark” brought him his second bid in 1937. In 1938, he won for “Thanks for the Memory.” He had 7 more Best Song nominations: “Faithful Forever” (1939), “So in Love” (1945), “A Gal in Calico” (1947), “For Every Man There’s a Woman” and “This Is the Moment” (1948), “Zing a Little Zong” (1952), and “My Flaming Heart” (1953). 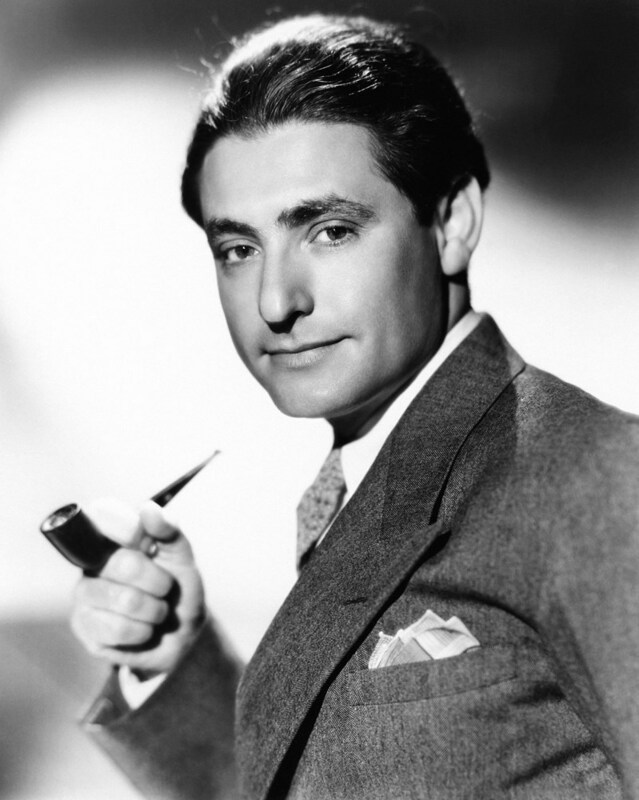 In 1948, Leo returned to Broadway and, with composer Jule Styne wrote the acclaimed lyrics for the smash hit, Gentlemen Prefer Blondes, the production which made a star out of the recent Bennington grad, Carol Channing. Just a few years later, Marilyn Monroe would reprise the role in the 1953 movie version. Leo worked on one more show, Sigmund Romberg’s posthumous The Girl in Pink Tights (1954), which starred French ballerina, Jeanmarie. He wrote with Jule Styne for a new medium: television — a production of Ruggles of Red Gap (1957) starring Peter Lawford, Michael Redgrave, and Jane Powell. Leo’s career came full circle with his final film, My Sister Eileen (1955). It was a story, like his story, but instead of Pittsburgh, it was Ohio and instead of one young man, it was two young sisters who come to Greenwich Village to become artists. Again, Jule Styne wrote the music. It starred Betty Garrett, Janet Leigh, Jack Lemmon and Sammy Davis, Jr. Blake Edwards was the director and a very young Bob Fosse did the choreography. In 1972, Leo was inducted into The Songwriter’s Hall of Fame. He came out of retirement for special occasions including the 1974 Broadway production of Lorelei, a sequel to Gentlemen Prefer Blondes, starring Carol Channing in the lead role of Lorelei Lee, which ran for 320 performances. In 1981, Frank Sinatra personally commissioned Leo to create an updated version of “Thanks for the Memory” for him to record on his new album, She Shot Me Down, and to perform on his live TV special, Bang Bang Baby She Shot Me Down.